Back pain is a problem that affects 80% of Americans at some point in their lives. Lower back pain can be anything from an occasional ache to a debilitating and constant discomfort that affects a person’s work and home life. This is partly because there are so many ways to trigger it. Though most lower back pain is a result of strain or injury spinal problems, or herniated discs, it can be a tension accumulation due to how a person walks, sits, and even sleeps. 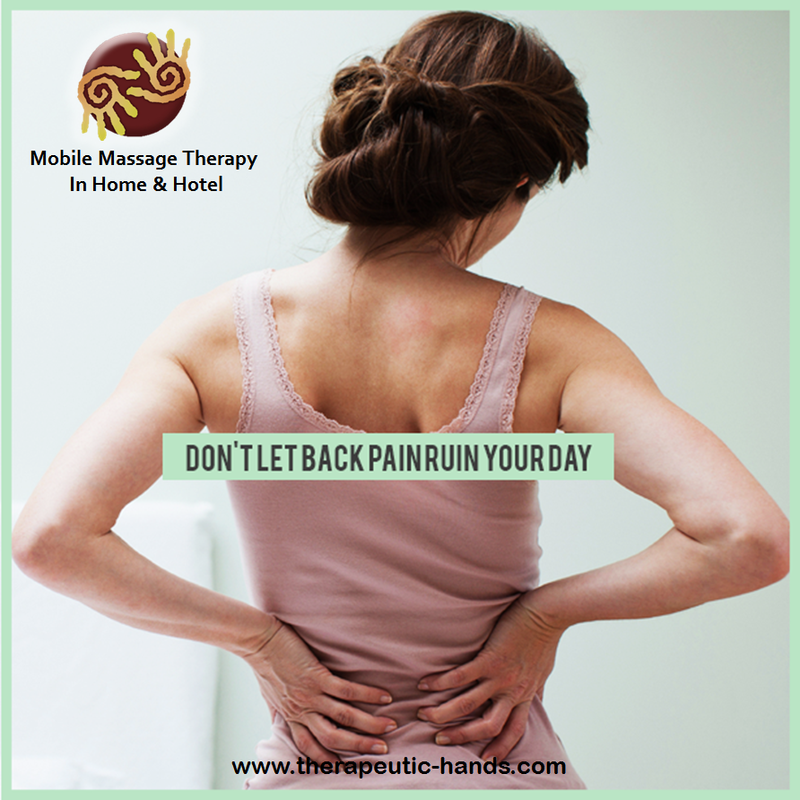 Studies show that massage therapy is effective in reducing pain, stress hormones and symptoms associated with chronic low back pain. Massage Therapy has been proven to be an effective support for a successful return to regular function, and ultimately good health and wellbeing. Read study: Lower back pain is reduced and range of motion increased after massage therapy. The American College of Physicians (ACP) developed this guideline to present the evidence and provide clinical recommendations on noninvasive treatment of low back pain. Massage therapy is given as an option for pain relief as nonpharmacologic therapy. Massage therapy is about more than just feeling good. Findings in research have shown that massage has the ability to relieve lower back pain, lower high blood pressure, strengthens the immune system, enhance sleep quality, improves concentration and facilitates faster recovery from injury. Experts estimate that upwards of ninety percent of diseases are stress related. And nothing ages us faster, internally and externally, than high stress. More than just being a stress and pain reliever, massage therapy has a lot more benefits to offer that actually contribute to a healthy lifestyle. The facts are undeniable. Consider the vast array of benefits you stand to gain from a massage and plan your next in-home massage today. I’m Angela Lind, Licensed massage therapist in Florida with 14 years of experience. I provide mobile massage and lymphatic drainage in South Florida: Fort Lauderdale, Weston, Plantation, Cooper City, Parkland, Boca Raton, Coral Springs, Miramar, Pembroke Pines, Davie and nearby areas. Invest in yourself. Invest in your health. Set an appointment now by calling or sending me a text message at (786) 290-7055 or book online by clicking the button below. Angela Lind, Licensed Massage Therapist since 2003 in Florida. Certified Lymphedema Therapist, specialized in Neuromuscular Therapy and Manual Lymphatic Drainage.